If you noticed a sudden drop in the page likes of any page you administer or any other page you like, then chances are that Facebook took strict action and deleted the fake likes from that page. 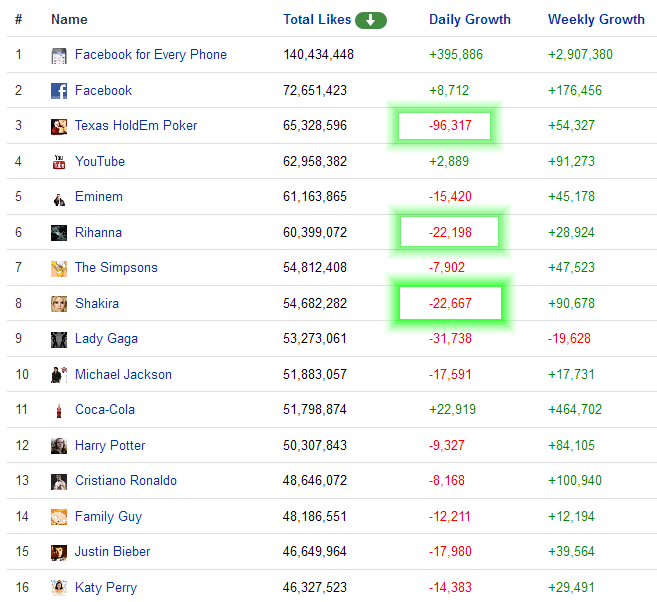 Some Popular Facebook Pages have even lost more than 10,000 Facebook Page Likes within a day. As reported by Techcrunch, data from Pagedata shows that Facebook likes of Zynga’s Texas HoldEm Poker has dropped by more than 96,000 in a day. Below screenshot can give you a better idea of no. of likes lost by many popular brands and musicians. Facebook‘s Fake Likes are usually a result of compromised accounts, malware, deceived users or purchased Facebook Likes. Almost a month ago, Facebook announced that it is going to increase its automated efforts to identify and remove likes that are suspicious. On average less than 1% of Likes on any page will be removed if they are following Facebook’s terms and conditions.